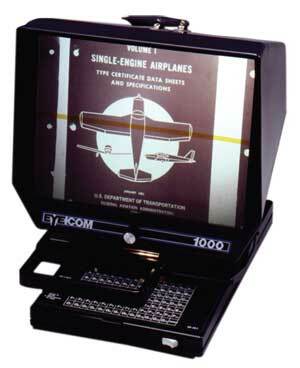 This low maintenance fiche reader is designed to view COM and Source Document microfiche at 75% of original size. Primarily a 75% COM reader, the EC 1000 covers all standard formats while providing a sharp, bright, easy to read image. An unique floating lens system assures constant focus over the entire film area. Lenses can be changed on the EC1000 microfiche reader and a drive belt focusing system provides razor sharp images with no backlash. The Eye Com EC1000 Portable Microfiche Reader comes with a carrying handle for portability and the fiche carrier locks into place for safe travel. An AC/DC cord is standard. A battery pack not available. Convenient, affordable solution for document viewing on the go. 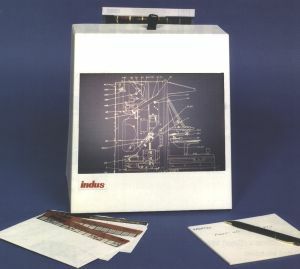 A portable Reader for all types of microforms, including fiche, jacketed microfilm, and aperture cards. Displays high resolution images of 24x reduced originals or 42x and 48x COM on the half letter (half A4) size screen. Focus control is center mounted. The illumination is very bright due to the use of a 25 watt quartz halogen lamp. Lamp change is simple and easy. This portable Reader is designed for use in vehicles and is offered with special mounting brackets to mount it permanently in utility vehicles. 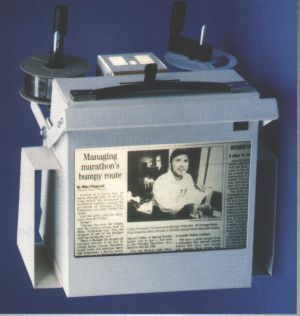 The Indus 456-HPR is a portable microfilm reader for 16mm and 35mm microfilm. This reader features a high resolution lens (24x) for sharp and clear images. With manual movement of the film, this very versatile Reader can be used by genealogical researchers. Image rotation is achieved by turning the Reader 90º on its side. Film scanning and focus control are by center mounted levers. A carrying handle is standard for convenient portability.